What's happened to lecture recordings prior to 17/18? Lecture recordings for 15/16 & 16/17 were hosted on the old, locally hosted, Echo360 system ‘replay.lse.ac.uk‘. Most of the FAQ’s and guides on our website reference to the new cloud hosted version of Echo360 ‘echo360.org.uk‘. If you require help with your lecture recordings that are found on replay.lse.ac.uk, please get in touch with: LTI.Lecturerecording@lse.ac.uk. How do I get my lecture recorded? To be recorded by the Lecture Recording system, you have to opt in. Please see our guides here: Scheduling your Lecture Recording Preferences. I don't have the option to opt in for lecture recording on LFY what should I do? 1. Check if you are teaching in a room that has lecture recording facilities – see our using lecture recordings page for more details. 2. Check if you are listed as a lecturer for the course – see the LSE timetables page for details. 3. Check that your teaching is classed as a lecture. Seminars are not automatically scheduled for recording as they may contain contributions from students who have not given their consent to be recorded. Inquiries about existing schedules or one-off recordings should be made to LTI.lecturerecording@lse.ac.uk. Can I set up a one off recording for my lecture? If you are teaching in a recording enabled room but have not scheduled the recording, you can start an ad hoc recording by following the step by step guide to setting up an ad hoc recording. This option can be used to record seminars as long as you have obtained written consent from your students to be recorded. Can I record only audio and no visuals? The automatic settings for the room will determine what is recorded, details for each room can be viewed on our using lecture recordings page. If you are using the ad hoc recording method then you will have the option to record audio only. Do I need to set up an Echo360 account? If you opt in for lecture recording you will be automatically be set up as an instructor on Echo360. You will receive an invitation from Echo360 to create an account but you do not need to set one up unless you want to carry out personal capture. Can guest lecturers be recorded? If any of your timetabled lectures are being delivered by a guest lecturer from outside of LSE then, please contact lti.lecturerecording@lse.ac.uk for advice on obtaining their consent. The official consent form can be downloaded and attached to the web form below. For guest lecturers delivering lecturers which are not timetabled but departmental events or public events please see this flowchart on the process. How do I view my lecture recordings? You can view your lecture recordings by setting up a link to Echo360 on Moodle see our step by step guide on how to set this up. The sound on my recording is poor what can I do? Your students won’t hear anything unless you use a microphone! In most rooms you can use the built-in microphone on the desktop, but in some you will need to use a radio microphone (provided in the room). In all cases, you have to make sure the microphone is plugged in and turned on! A list of the microphone options for each room is on our using lecture recordings page. If you want to request a lapel mic or think that there is an issue with the podium mic please contact AV email: imt.av.support@lse.ac.uk, extension: 5300/5400 from any internal phone. A podium mic has a range of approximately 2m from the mic, however the closer you are to the mic the better. A lapel mic often has an on/off button, a mute button and also an indication of battery levels. Training can be provided at the start of the lecture (email imt.av.support@lse.ac.uk). Boundary mics have a wider range, but sound quality isn’t as good as a podium mic when near the mic. All safes have a digit access code. This is available by calling 5300/5400 from any internal phone including the one in the teaching room. How do I make my lecture recordings available to students? Lecture recordings can be viewed through Moodle. See our step by step guide on how to set this up. Please note that your students must use the Echo360 activity in your Moodle course to access the recordings. You will not be able to distribute these links to your students by email, or on a web page outside of Moodle. Using the method above ensures that your students are correctly enrolled in your Echo360 sections. If you want to make recordings from other courses available to students on your Moodle course see our guide. Can I make my lecture recordings only available to individual students? You may want to make your lecture recordings immediately available to select students, you can do this by setting up the link to recorded lectures on Moodle and then going into the edit settings of the Echo360activelearning activity. In the edit settings under Restrict Access, you can Add Restriction and then select User profile and Email address. You can now enter the students email address and Add restriction. Click on the eye icon to make the activity hidden to those that do not meet the conditions. Repeat as necessary, then Save and display, the activity will only be available and visible to the nominated students. How do I make my lecture recordings available to students after or up to a certain date? 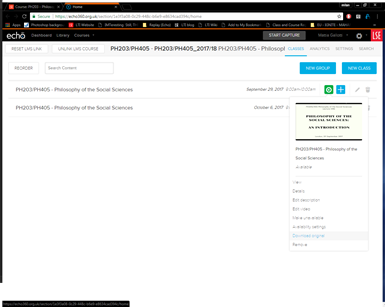 Set up the link to recorded lectures on Moodle and then go into the edit settings of the Echo360activelearning activity. In the edit settings under Restrict Access, you can Add Restriction and then select Date fill in the details and select Add restriction and then save and display the activity will only be available to students according to the date set. Can I download the lecture recordings? If you are the owner of the recordings then you can download them. Set up the link to recorded lectures on Moodle, click on the link to bring up your list of recordings in Echo360 in a new tab, then click on the green triangle next to the recording you want to download. This should bring up a drop down list – select the download original option. How do I make my lecture recordings available for students to download? The ability to download lecture recordings is disabled by default. If you wish for your students to have the option to download the recordings, you can follow our short guide. Can I edit my lecture recordings? Can I add files or notes to my lecture recordings? Yes, set up the link to recorded lectures on Moodle, click on the link to bring up your list of recordings in Echo360 in a new tab, then click on the blue plus button to add files to your individual recordings. Can I/students access lecture recordings from a previous year? Lecture recordings from previous years have now been archived and are on a different platform. If students need to view recordings from previous years for resit examinations then please contact LTI.Support@lse.ac.uk to request that they are un-archived. Can I create my own recordings? Yes you can download the Echo360 programme to your personal or work computer and make recordings of your audio and screen. See our step by step guide on personal capture for details. I am a student can I request lecture recordings? Lecture recording is not available for all courses and it is up to individual lecturers to request and then make the recordings available to students. Please contact your individual lecturers to find out if they have opted in for lecture recording and when they will make the recordings available to students. I am a holding a public event can it be recorded? The Events Office and the Film and Audio Team work in partnership with AV Services to deliver podcasts and videos of LSE public lectures and events. See the AV website and this flowchart for more details. If you have a question that is not listed here please contact LTI.lecturerecording@lse.ac.uk.